A CD-ROM drive can be used as a stand-alone unit for playing digital audio CDs without interfacing with a computer. The stereo output of CD player available at the audio jack can be amplified using audio input facility which is normally available on a tape-deck/tape-recorder or a stereo amplifier. Audio socket on front/rear of the CD-ROM drive is capable of driving headphones or speakers of less than 500mW. Proper stereo jacks for interconnection between CD-ROM drive and tape deck are available from computer/tape recorder spares vendors. The principle of operation is illustrated here with the help of block diagram. The 4-pin power supply socket available at the rear of a CD-ROM player is meant for +5V, ground (two middle pins) and +12V inputs. 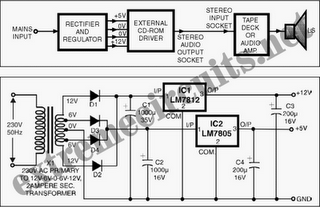 The power supply can be easily derived using a conventional power supply circuit as shown in the figure. If you have an external CD-ROM drive, it can be simply plugged into the mains since it has self-contained power supply circuit inside. While there may be minor differences amongst the available CD-ROM drives’ external controls, a typical drive’s controls are shown in the figure here. Please ensure that a proper power supply connector available from computer spare parts vendor is used for connection to CD-ROM drive. To identify +5V and +12V pins on the drive connector, please note that in the computer +12V is routed using a yellow wire and for +5V a red wire is used, while for ground black wires are used with the supply connector. Once the power supply has been connected correctly, you will notice that LED indicator on the drive starts flashing. Now the digital audio CD can be loaded after pushing the eject button. A second push of the same button causes retraction of CD carriage into the drive. One can change the track (song) on the CD using play switch on the CD-ROM drive.